Owing to its unique design, this Beurer model not only reduces fatigue but also has a fantastic therapeutic effect. Interchangeable pedicure attachments work for gentle and effective feet care. A bit heavy when filled with water, and not so easy to drain. 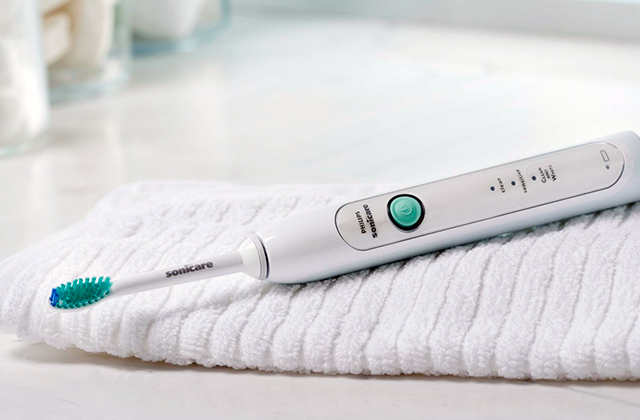 Spa salon procedures are now possible right at home! 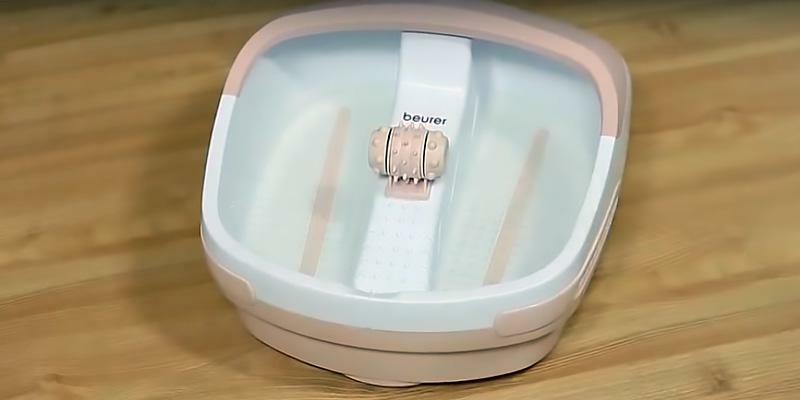 As functional and user-friendly as it is, the Beurer foot bath brings a stunning rejuvenating effect. Ergonomic foot rollers in the middle allow massaging your inner feet for the maximum revitalising effect. A double-wall housing of the unit provides excellent heat insulation. Somewhat noisy when its bubble function is activated. 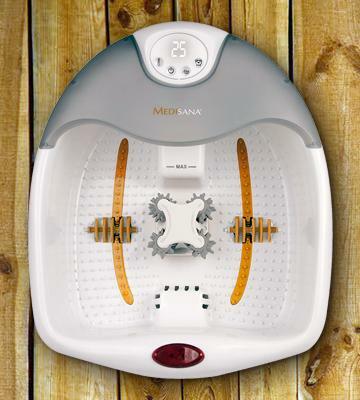 If you are looking for a heated foot bath to enjoy invigorating spa therapy at home, try this Medisana model. Save time and money on visiting a salon! Enjoy invigorating reflexology massage at home! This item is equipped with two additional foot rollers to activate acupressure points on your soles, which will improve your overall health. Its power cord is a bit short. It's truly the best value for the money. This wonderful model is equipped with all common programmes to ensure the utmost relaxation. 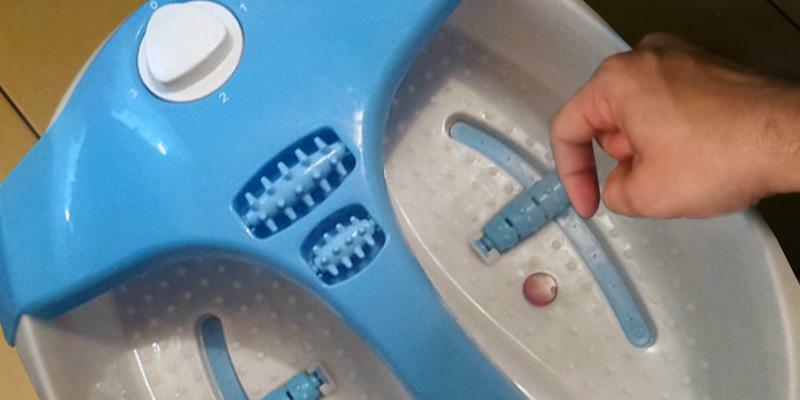 This foot spa is equipped with 16 built-in magnets to provide magnetic therapy while you are taking a foot bath. It helps stimulate circulation and cell metabolism for even more invigorating effect. No massage rollers on the bottom. 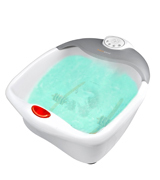 Improve your health, prevent illnesses, and mitigate fatigue with this fantastic foot bath spa. Your body will thank you afterwards! Thanks to as many as 9 nail care accessories included in the box, after a soothing soak, you will be able to pamper your feet with a pro-salon pedicure. The plastic it is made of could be of a better quality. 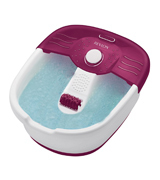 Dive into relaxation with the Revlon RVFB7021P that uses bubble and vibration massage to relieve tension in your feet and stimulate your whole body. The Beurer FB50 is one of the most praised models on the market owing to its variable foot massage options and a fantastic invigorating effect it provides. Combining water and massage healing properties, this foot bath spa improves blood circulation, soothes muscles, reduces fatigue and swelling. Vibration and bubble massage help relax, while heated foot bath speeds up recovery after strains and injuries, plus it's an effective cold precaution. This model is equipped with four integrated magnets and eight infrared light dots for a magnetic field and infrared therapy. A built-in timer will automatically turn off the appliance after the session, so you can relax and enjoy complete relaxation. In addition, the unit comes with three interchangeable attachments: massage, brush, and pumice stone. Just install the desired attachment and gently scrub your feet. Regular removing of dead skin from your soles will help you forget about corns and callouses. In a sum, this Beurer model is an excellent choice for you and all your family members. Dip into relaxation after a hard working day! Stress and fatigue are known to cause headaches. 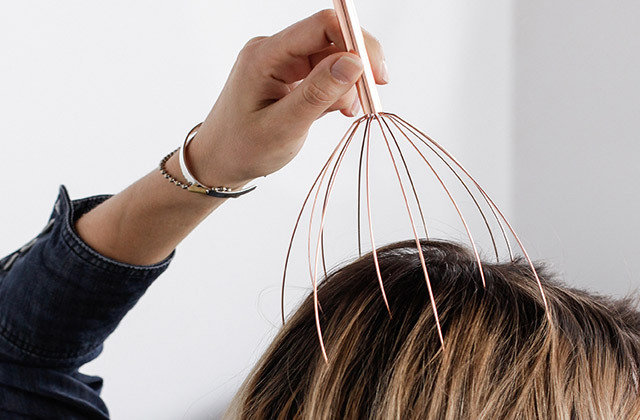 A perfect way to reduce stress and relax is to use a head massager. After a long day at work, nothing can soothe fatigue like a heated foot bath can! As pleasant and relaxing as it is, hydrotherapy is a perfect way to improve your well-being. A heated bath is a perfect treatment for cold and an effective insomnia remedy. Moreover, it helps recover after a strain or other injury, let alone its skin softening and healing benefits. 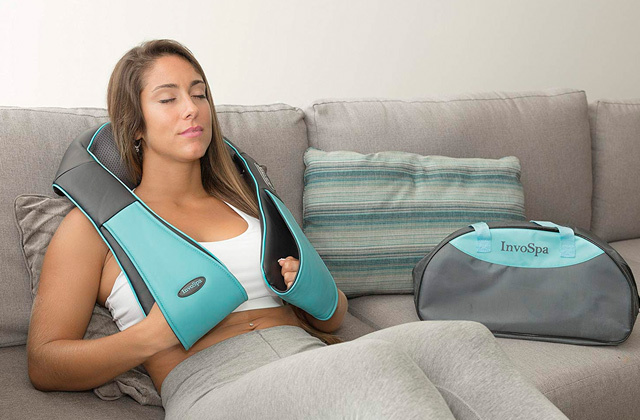 This functional device provides vibration and bubble massage, heating and infrared therapy, as well as acupressure massage. Using any of them or even their combination, it is easy to achieve the desired invigorating and therapeutic effect. This Medisana model's heating function allows comfortable temperature adjusting. You can choose preferable temperature with 3°C increment (from 20°C up to 39°C) and with 1°C (from 39°C up to 48°C) each time you press its temperature selection button. Moreover, you can set appliance's timer for 20, 30, 40, 50, and 60-minute session and enjoy relaxing massage without controlling the time. It is easy to activate your acupressure points owing to ergonomic roller attachments. Besides, this awesome device is easy to clean after use. 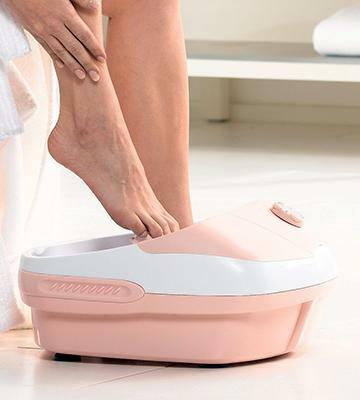 All in all, Medisana foot spa allows maximum relaxation and has a marvellous invigorating effect. After enjoying your heated foot bath, it is time to take care of your soles, using a callus remover. Working on feet or/and wearing uncomfortable shoes can make you feel exhausted by the end of the day. Actually, this foot spa can become a wonderful remedy for your tired feet. It will help brush tiredness off and keep you toned up and refreshed. Did you know that there are multiple nerve endings responsible for your wellbeing on your feet? Hopefully, this foot bath spa is equipped with 4 foot rollers to reach them all! Moreover, 2 of these massage rollers are situated on the item's top. Such user-friendly design allows comfortable foot massage that will have a positive impact on your entire body. You can choose one of three available settings: vibration, bubbles, and bubbles + vibration. Note that a preset infrared light works for all programs. Add aromatic oils and salts to your foot spa and enjoy maximum relaxation. And do not forget to moisturise your feet after a warming soak. A healthy sleep is essential for our wellbeing. One of the best ways to overcome sleep-related problems is wearing a sleep mask. It will block unwanted light to create perfect conditions for drifting off to sleep. It is no secret that spa procedures help relax and improve your overall health. Hopefully, today, you can enjoy the benefits of foot bath spa right at home and the Beurer FB25 is an awesome device that will help you enjoy vibration, heating and bubble massage. Choose whichever you like to soothe fatigue and get a fantastic invigorating effect! 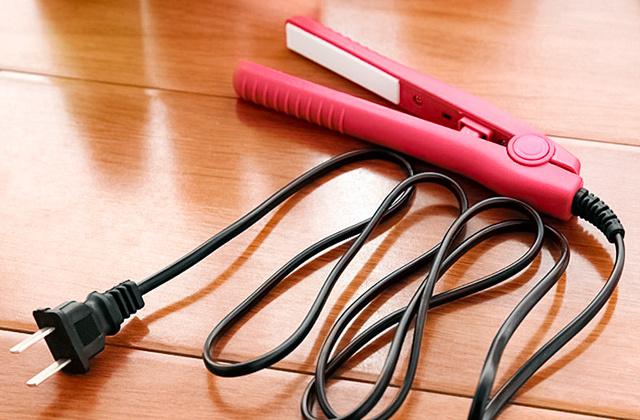 An ergonomic splash guard, cord winder, and non-slip rubber feet will ensure comfortable and safe use of the appliance. Yet, owing to one absolutely special feature, the Beurer FB25 stands out among its rivals. We are talking about 16 magnets built in the foot bath. 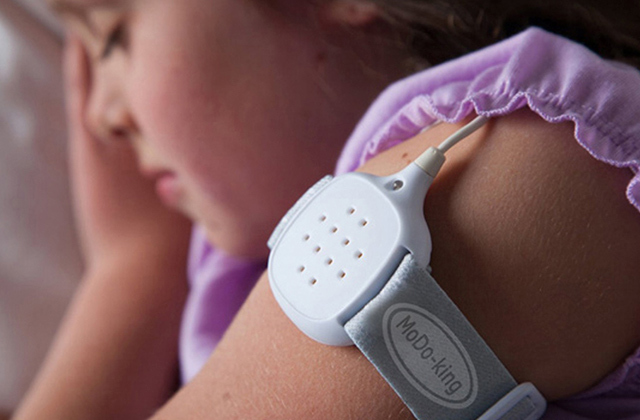 Magnetic therapy has a resolving, antihydropic, soothing and antispasmodic effect. So, let the Beurer FB25 become your family therapist to take care of your and your nearest and dearest health! In addition, the item is easy to clean, just rinse and drain it after use. The fantastic foot spa will surely bring you physical, mental, and emotional benefits! A high-quality massage table is essential to make a massage session comfortable for both a massage therapist and a client. Our toenails deserve no less attention than our tired feet. 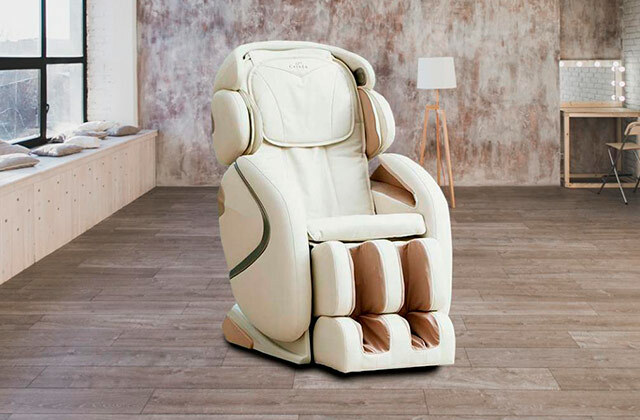 This wonderful foot spa was designed to combine health benefits of acupressure, bubble, and vibrating warming massage with a complete nail and foot care. Boasting an affordable price, this item has many features you would expect to get in more expensive models: a bubble massage function, an accunode basin, roller and pumice stone removable attachments, a splashguard, and a waterproof toe-touch button. With that, the types of massage provided are quite diverse to relieve your tired feet and prepare them for a pedicure. All you need for nail care comes with the purchase - a nail brush and a nail cleaner, 2 bamboo cuticle pushers, a cuticle stick and scissors, an emery board, and 2 toe separators. 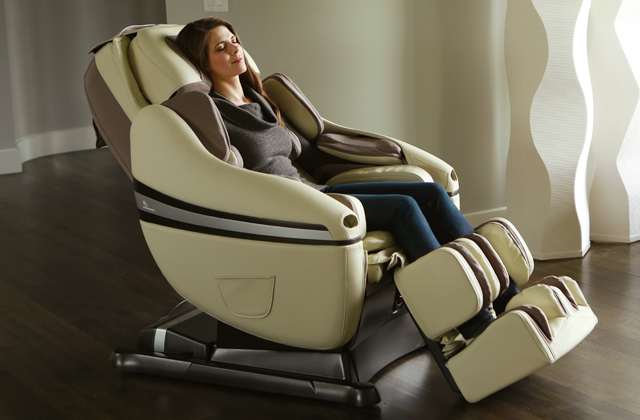 To make each massage session as comfortable as possible, the unit is equipped with a comfy foot rest. Overall this is a very good foot bath massager to consider if you seek to buy an affordable yet versatile massager with a diverse set of functions and accessories to fit various needs. Get your feet relaxed, and add a few drops of your favourite essential oils to multiply the effect of massage. What Is a Foot Bath? Feet and legs require special care and attention, especially when exposed to constant strains. If you work on feet or wear uncomfortable shoes, your legs will become heavy and weary sooner or later. In order to avoid such physical exertion, we offer a solution, an excellent way to relax and take care of your feet. It’s a foot bath spa – a wonderful remedy in our modern busy world. The delicate revitalising power of water has been known since the ancient times. Just like the fact that you can improve your health by stimulating special acupressure points. The scientists have confirmed hydro massage’s benefits and admitted its revitalization properties. There is no need of going to a beauty salon, you can simply use this wonderful invigorating foot bath at home! The foot spa will do an excellent job and the massage session will only take 15-20 minutes. Furthermore, we encourage you to take the heated foot bath in the evening, to ensure a deep and sound sleep. You will wake up fresh and alert, ready for new achievements! 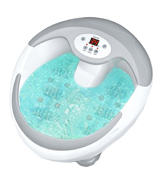 We have selected 5 best foot bath massagers. There are also some tips on how to choose an appliance that will suit you best! 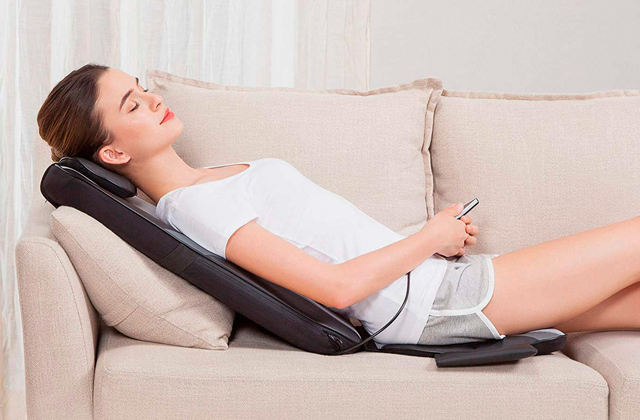 Please, look through our neck massagers review. 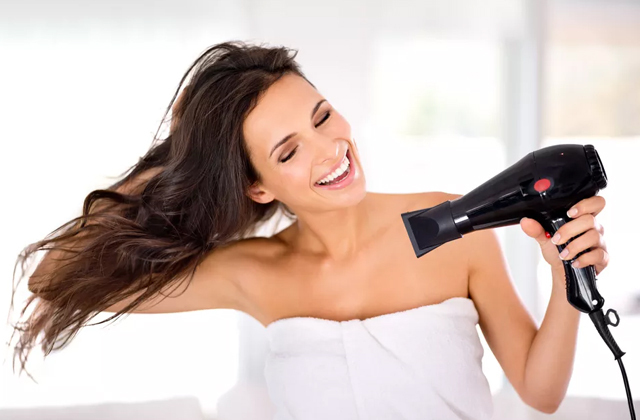 You will get even better results using a combination of both appliances! You may also be interested in buying a back massager. Most of the models in our review provide several kinds of massage. They help relax tight leg and feet muscles, strengthen your bands and improve your blood circulation. 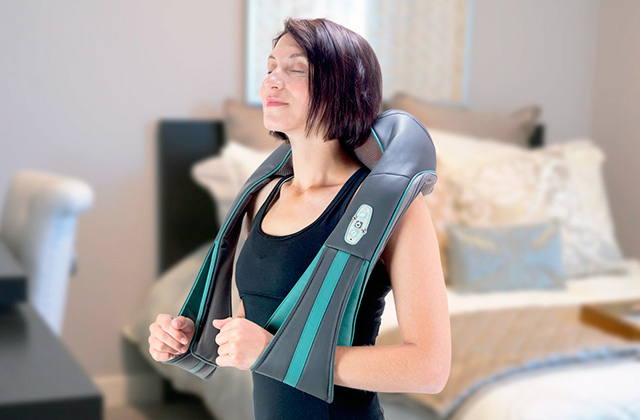 The most popular are hydro and vibrating massages combined with the heat. 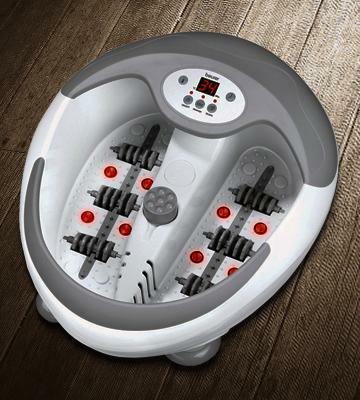 Our reviewed foot spa massagers are equipped with foot rollers to stimulate the acupoints on your soles. Oxygen bubbles massage normalises blood circulation. Penetrating and relaxing vibrating massage takes the weariness away. A waterfall feature works for the most revitalising massage of your feet tops and toes. It reduces a muscle pain and helps improve your general physical and mental state. Some foot spas are equipped with infrared lights that help deliver energy to the cells, which has a great healing effect. A heating foot bath enhances muscle elasticity and boosts up circulation. It ensures a quick recovery after stretching and other injuries. Your chosen unit performance depends on its massage programs. 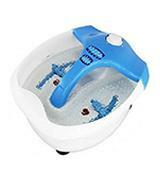 For the ease of use, a foot bath massager may have a single program including maximum massage types. On the other hand, you can choose a model with multiple programs offering various combinations. As for the heating, some models can heat the tap water, others just maintain its warm temperature. Overheating protection ensures a safe use of your heated foot bath. A drain tube at the bottom will help you easily discharge the water. A filter will help prevent the drain system from clogging up. Please, pay your attention to all these features to choose the most convenient item. Now it is time to consider extra features of your chosen device. You can increase its therapeutic properties by adding salts and oils to your heated foot bath. An aromatherapy dispenser will help you plunge into the atmosphere of relaxation. Some models come with pedicure attachments. For example, a pumice stone, which will help you remove hard skin and corns. A brush will rid you of dry skin on feet. Various massage attachments allow applying pressure to acupoints. 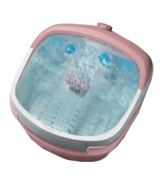 Spacious dimensions of your foot spa will make it possible to use the appliance by all your family members. The item is usually measured using Men’s feet size from 12 up to 14. Ergonomic attachable wheels or rubber non-slip feet add to its usability. A splash guard will help you keep the floor dry and clean. An easy-to-use operation panel is an important feature as well. You can choose a model with an ergonomic toe-touch control. The number of buttons depends on the appliance performance. High-class multifunctional models have a convenient operation panel with a variety of massage programs. 1. Stanley J. Swierzewski Overview of Hot Foot Bath, HealthCommunities. September 22, 2015. 2. More about our foot bath test, CBC. January 16, 2014. 3. Joseph Hindy 10 Irresistible Health Benefits Of Spa Baths, Lifehack. 4. Hydrotherapy, Wikipedia. December 18, 2016. 5. Pedicure, Wikipedia. December 12, 2016. 6. Barry Dench Magnetic Therapy, How And Why Magnets Effect The Body, Streetdirectory.com.